Details of another upcoming 1-day live interactive training workshop for C# developers looking to take their design skills to the next level. I'll be helping you get to grips with S.O.L.I.D. and much more besides with practical hands-on tutorials and exercises. Just a quick note to plug a live online training event that's happening on Saturday March 17th. If you're a C# developer wants to get to grips with the refactoring discipline and the Resharper plug-in for Visual Studio, this is the perfect kick start. Refactoring's an essential skill for a code crafter, but still something a lot of even quite experienced developers have yet to wrap their heads around. Take your code craft to the next level. There's a morning and afternoon session, each lasting 3 hours. Places are limited to 8 in each session, to ensure you get more attention from your trainer (me) while you tackle the exercises. A quick reminder about the special offer I'm running this month to help teams whose training budgets have been squeezed by Brexit uncertainty. 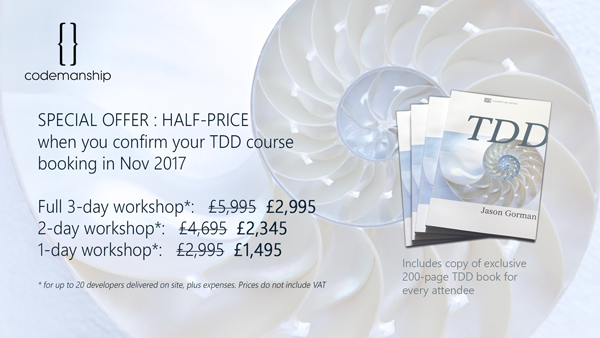 If you confirm your booking for a 1, 2 or 3-day TDD training workshop this month (for delivery before end of Feb 2018), you'll get a whopping 50% off. This is our flagship course - refined through years delivering TDD training to thousands of developers - and is probably the most hands-on and comprehensive TDD and code craft training workshop you can get... well, pretty much anywhere. There are no PowerPoint presentations, just live demonstrations and practical exercises to get your teeth into. As well as the basics, we cover BDD and Specification by Example, refactoring, software design principles, Continuous Integration and Continuous Delivery, end-to-end test-driven design, mocking, stubbing, data-driven and property-based unit testing, mutation testing and heap more besides. It's so much more than a TDD course! And every attendee gets a copy of our exclusive 200-page TDD course book, rated 5 stars on goodreads.com, which goes into even more detail, with oodles of extra practical exercises to continue your journey with. If you want to know more about the course, visit http://www.codemanship.com/tdd.html, or drop me a line. 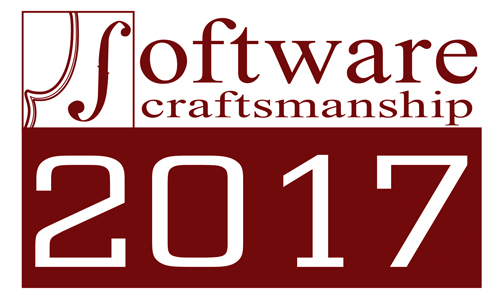 It's early days, but planning is underway for this year's Software Craftsmanship conference. Since it returned last year, SC20xx has evolved from a conference where talks were banned, to a conference with no fixed sessions at all. We stripped it down to the bare essentials of what folk said made previous SC conferences fun and worthwhile. Basically, we want a chance to meet likeminded code crafters, socialise, exchange ideas, and - most of all - code. Instead of scheduled sessions, we'll have the space and the resources needed to tackle interesting and challenging programming projects. Work in pairs, work in groups, work by yourself (although, really, why come all that way to work alone?) Build a bot. Write a tool. Start a tech business. Put your Clean Code skills to the test. It's all good. SC2017 will be on Saturday Sept 16th, and last year we had events being hosted in London, Manchester, Bristol, Munich and Atlanta, GA. This year, we're hoping for even more hosted events all around the world. It doesn't require much organisation, so drop me a line if you're interested in running one where you are. Unofficially, the London event is already open for registration (there's a small fee to cover costs - SC2017 is a non-profit event), and more details will be posted soon. Just a quick reminder about my upcoming Codemanship TDD training workshop in London on May 10-13. It's quite possibly the most hands-on TDD training out there, and great value at half the price of competing TDD courses. Will The Travel Ban Hurt US Tech Conferences? Recent worrying developments in US politics could have a significant impact on the country's standing in the tech industry. The lightning-speed changes to immigration policy (and, yes, I did choose that phrase carefully) mean that a significant number of our peers are excluded from entering the country, and many more are afraid to leave in case they're not allowed back in. Believable reports of all non-citizens facing stringent checks - e.g., of their social media accounts - when trying to enter the US mean that many more in our (mostly progressive and liberal) profession could face difficulties at passport control. I've been seeing more and more tweets from people saying they won't be attending certain US tech events as a result of all this: either because they're worried they will be given a hard time getting there, or in solidarity with those who are banned. So I ran a straw poll on Twitter, and the results suggest that - in fact - the majority of us feel the same way. 70% of the 160+ respondants said recent events had caused them to reconsider attending a tech event in the US. After the success of last week's TDD 2.0 training workshop, I've immediately scheduled another one for the Spring. It's 3-days jam-packed with hands-on learning and practice, covering everything from TDD basics and customer-driven TDD/BDD, all the way to advanced topics other courses and books don't touch on like mutation testing and non-functional TDD. And it comes with my new TDD book, exclusive to attendees. If you fancy a code craft skills boost, twist the boss's arm and join us on May 10th.